Laughter Pond is a county owned pond open to public fishing. It has a fishing pier. 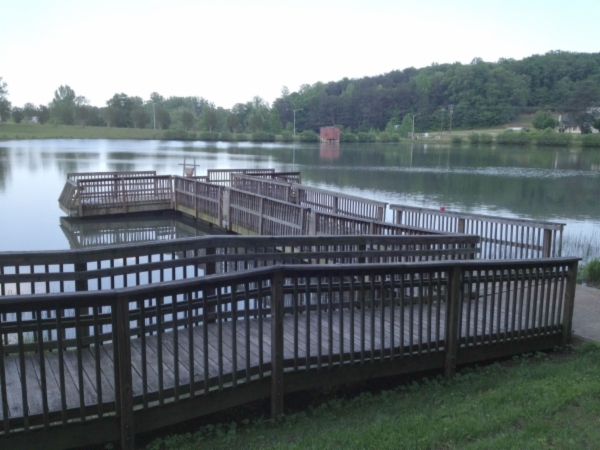 The pond is stocked by the NC Wildlife Resources Commission each year between April and October. See the stocking schedule below. Laughter Pond generally receives several thousand channel catfish each year. Each stocking event takes place the first week of every month between May and October, with about 700 fish each time. The target size for those fish is 8-12 inches. There is an automatic feeder at the pond that currently runs twice per day, at 9am and 7pm. A fishing license is required to fish at the pond. They can be purchased at McGuinn's in Sunny View, Pace General Store in Saluda, Silver Creek Campground, and Foothills Gun Gallery in Columbus. How much does a fishing license cost? Click here are the rates per the NC Wildlife Commission.